Marcia The Art of Photography Gallery Blog: Is Your Child Adorable? A Winner, Too? Is Your Child Adorable? A Winner, Too? 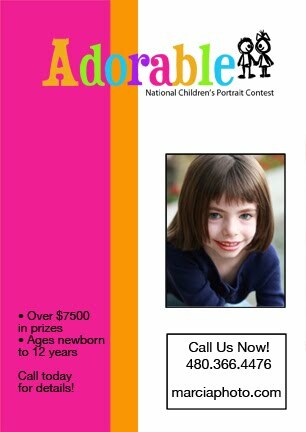 Starting now we are participating in the annual ADORABLE National Kids Portrait Contest. For a limited time only, all children photographed at Marcia The Art of Photography are eligible to win $7500 in prizes nationally along with local prizes, too. Special sessions are available at $79 per child (a 69% savings) with promotional print package pricing provided only until the contest deadline. Hurry now for best portrait times for your child.